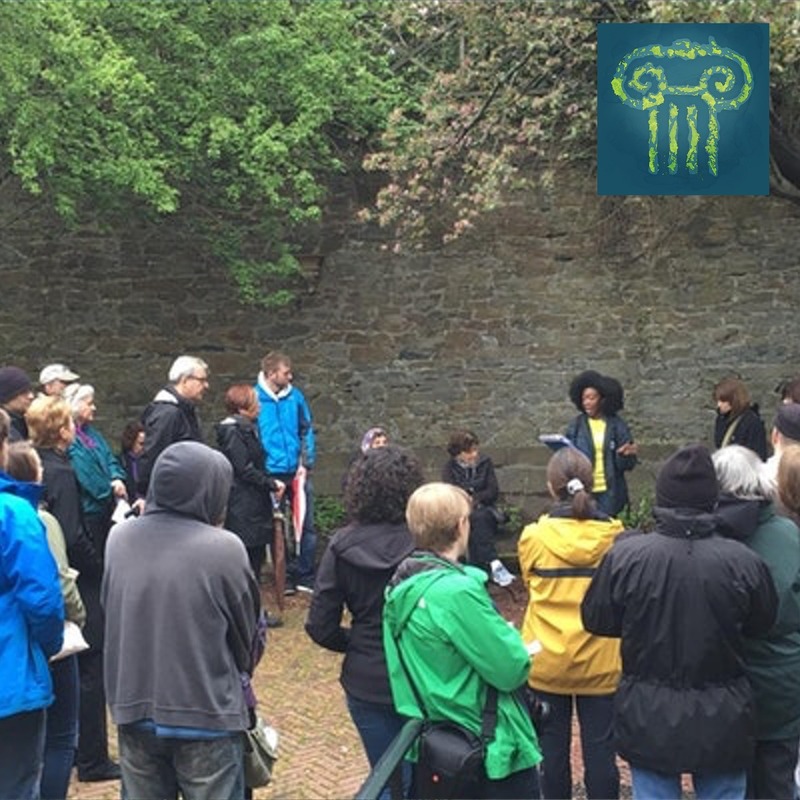 Elon Cook created the College Hill and the International Slave Trade Walking Tour in Providence after researching the crucial and massive role that Rhode Island played in the history of slavery. The walking tour covers an an area of about one square mile in and around Brown University. Here, wealth and stability were created off of the buying and selling of enslaved people in Rhode Island and elsewhere. The built landscape of Providence serves as a museum without walls, and Elon considers each of the stops on the tour to be a different mini-exhibition. In this episode, Cook talks about creating the walking tour, the glossing over of local history, and tracing her ancestors’ genealogy before the 1860s. Elon Cook is the program manager and curator for the Center for Reconciliation, a non-profit focused on educating the public about the United States’ history of slavery, slave trading and resistance. This episode was recorded immediately after a walking tour on June 22nd, 2017. Tickets to the next walking tour on July 14, 2017 can be found here. Below is a transcript of Museum Archipelago episode 24. 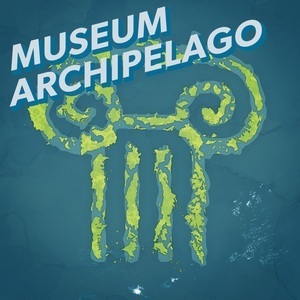 Museum Archipelago is produced for the ear and the only the audio of the episode is canonical. For more information on the people and ideas in the episode, refer to the links above. Elon Cook: My name is Elon Cook and I am the program director and curator at the Center for Reconciliation, consultant for the Robin's House African American historic site in Concord, Massachusetts. And I am the creator and lead guide and only guide at the moment for the College Hill and the International Slave Trade walking tour in Providence. So I'm originally from Maryland. Border state. Never learned that as a border state, that also meant that there had actually been slavery in the state of Maryland because I like most kids, don't learn about local history. My school just didn't teach it, but let's see. Right before I moved here, I had actually been working at the Smithsonian, at the National Museum of African American History and Culture. And I was working in the education department. I had been trying to get into the curatorial department, found out that the Smithsonian's pretty hierarchical and they love degrees and if you don't have certain degrees, the likelihood of you getting, you know, advancing to another level is extremely slim, unfortunately. And so I was looking for scholarships, found the John Nicholas Brown master's fellowship for the study of the public history of slavery. And I got up here and I was still trying to figure out, I still don't understand why Brown University of all the Ivies, of all the schools in New England, of any university, why do they have this fellowship for the study of slavery in Rhode Island? And it wasn't really until I got up here that I started shifting focus, because I'm a genealogist and I'd been focusing a lot on the development of racial ideologies in the Americas. So I thought everything that was happening was in the south. Like Virginia, my parents are from Georgia and Alabama. So I was trying to figure out why would I do that. Got up here and over the course of the two years, and then also learned a lot more once I graduated, realized that Rhode Island was connected to 60 to 90% of all of the American colonial and post colonial slave trading, international slave trading and just blew me away. Yeah. And all that wealth that's generated from that is just insane. That story of not really being sure about the north and like, I just moved here from North Florida and I also had the sense that in the north it just didn't feel like the history of slavery would be so acute up here. I just thought that, to even realize that there was any ... I think people up here, we do a pretty good job of hiding that. We do. But it's not just New Englanders or northerners that hide it. A lot of it I think is just the way we're taught about slavery, the American educational system. And I've now noticed that this is the pattern kind of around the world that especially for younger kids, you distill everything down into these really simplified narratives. There's good guys, there's bad guys. It's all about putting people on opposing sides of a story. And then maybe there's a unification or maybe there's a complete splitting. And you know, there's the beginning, a middle and the end. And the way I was taught about slavery was that slavery was a southern thing. It had a lot to do with Virginia and South Carolina and Georgia and Mississippi. And then there was some dude named Frederick Douglass and some lady named Harriet Tubman who tried to free some people. Never bothered to tell us that the state of Maryland where we were from, that's where Harriet Tubman and Frederick Douglass were from. That connection was not made. And then Lincoln happened. And then everything was fine. Yeah. And then everything was cool. And then World War II and then the civil rights movement, and then everybody's equal in school. The end of the story and something about women getting to vote or whatever. So there's like a lot of glossing over a lot of things. And the way my school taught history was war by war by war. So Revolutionary War, War of 1812. A lot of things happen between the Revolution and the Civil War, but we didn't really focus on much of that, if any. And definitely not really anything that had to do with slavery. And the only thing I remember about slavery that I learned in high school was there was like a pop out box in the textbook that had black people in a field picking cotton. And like, that's all I really remember learning during that time. Right after I graduated from Brown with my masters in public history, I was struggling to find a job. It felt like no one wanted to hire someone who had spent two years studying slavery. I wonder why. And I was just having a really hard time. But the Slavery and Justice Center had a group of international visitors who were here specifically to study slavery for like, two weeks for a conference. And they asked me to walk people around, give a walking tour. They knew I did stuff like that. So they said, you know, since I had been studying this history, would I mind putting together a little walking tour of the local history of College Hill related to slavery? And about three days later, I had developed the initial version of this tour, which was only about an hour. And we didn't get to go in any of the stops cause I didn't know how to do, how to organize any of that. Through the process of doing the research, I came across a lot of these very local stories and realized that these super local stories had an impact across the state, across the region, across the country, across the world. You mentioned that the walking tour will be a part of whatever comes next. But when you're at work, when you're thinking about these kinds of things, why does a museum seemed like an appropriate way to present this information and how does kind of the walking tour fit into that? Elon Cook: So with the Center for Reconciliation, since we're in the process of developing a museum space in the Cathedral of Saint John here on North Main Street, we recognize that we are currently a museum without a ready building.We're still trying to figure out even how to use the space in there exactly. And if you look at a lot of museums, the Smithsonian, for instance, the National Museum of African American history and culture was doing exhibitions before their building was remotely, before they even broke into ground, they just had to use other spaces. So, this walking tour allows us to use the built landscape of Providence as a museum. So, I think of each of our stops as a different mini exhibition. So, we go in the John Brown house, we see the Sallie gallery. We'd go to the John Carter Brown library and we see another exhibition of original historic artifacts. We go to the Stephen Hopkins House and suddenly you're walking into a room where enslaved people lived and worked. And then you come to the Cathedral of Saint John, where at least three and slave people worshiped, along with their owners. So, it's really about using what we currently have until we have our own home. But this tour is going to keep going, even once we move into the cathedral. And that was another fascinating theme of the tour was how little we have. How little records we have to work with. And I thought you made a very effective point what records we do have are through the eyes of the owners of enslaved people. Elon Cook: That's the hard part of doing historical research unfortunately, is that, or when you're researching enslaved people and kind of researching people of color in general, it can be really hard the farther you go back. In my genealogical work, it took a long time to get over the hump from 1880 to 1870 to 1860, because then suddenly you're crossing from freedom, past the Emancipation Proclamation, into the point where nearly all of my ancestors are enslaved. And then going back further and further and further and further and still trying to figure out how do we find these people, when they suddenly go from being Tom Magby to a boy, age 10 to woman? That's it. Or, to just like a hash mark or to just a number, 20 enslaved people on a census record. It makes it so much more difficult to do that work. And it's so hard to trace anyone. So I actually, in order to do my ancestry, in order to get back after the mid 1800s or the early 1800s, actually I had to switch to the white side of my family and trace my ancestry through the owning side and then trace back down and say, oh, well now that I know who the owners are, I can find more information through their diaries, their wills, all kinds of personal documents and finally get names back. If you want to understand why we have all this violence related to race in this country, you have to go back to the history. Otherwise, none of this makes any sense. It's just crazy. It's just random violence for no reason. That's just so mysterious. And when you hear, when you learn the history of like, oh, there's links in a chain going all the way down from these individuals in the 1700s or the 1600s all the way down to right now.